…to a time when I did not have much experience with PMC, but I knew I loved it. 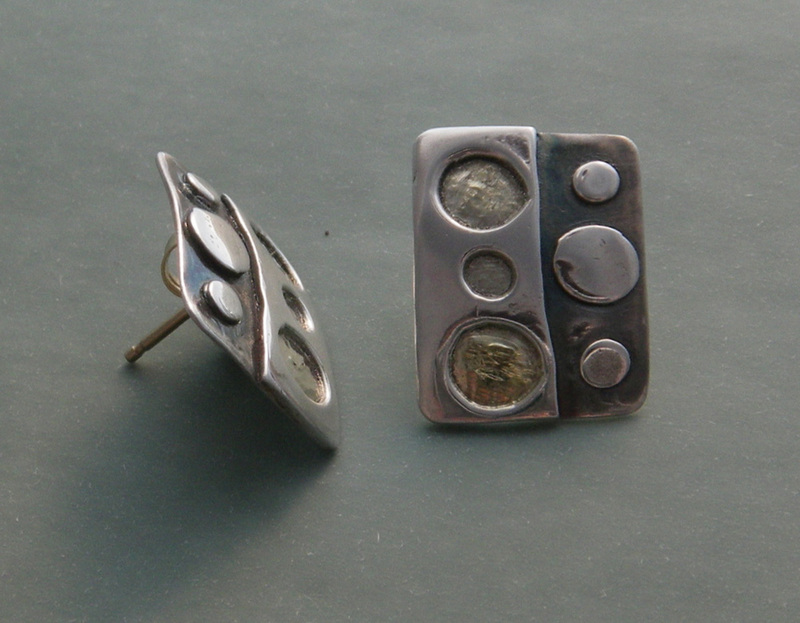 In July, my sister-in-law Karen asked if I would put some gold posts on a pair earrings I gave her a hundred years ago. The sterling posts were starting to irritate her ears. “Absolutely no hurry. Just when you get around to it.” (Words that always give me way too much time to procrastinate. Things get lost in my studio when they fall into the “no hurry, really” category.) So, now it is almost the end of October and Karen and her husband headed back to Baltimore today. It was the deadline I needed to change the posts on her earrings before she left. What I love when I look at these is that they were made when I did not know you could smooth edges with an emory board before firing. They mark a time before I had ever used PMC sheet and punches. The holes were made with drinking straws because I did not have any fancy little brass tubes to make perfect cuts. 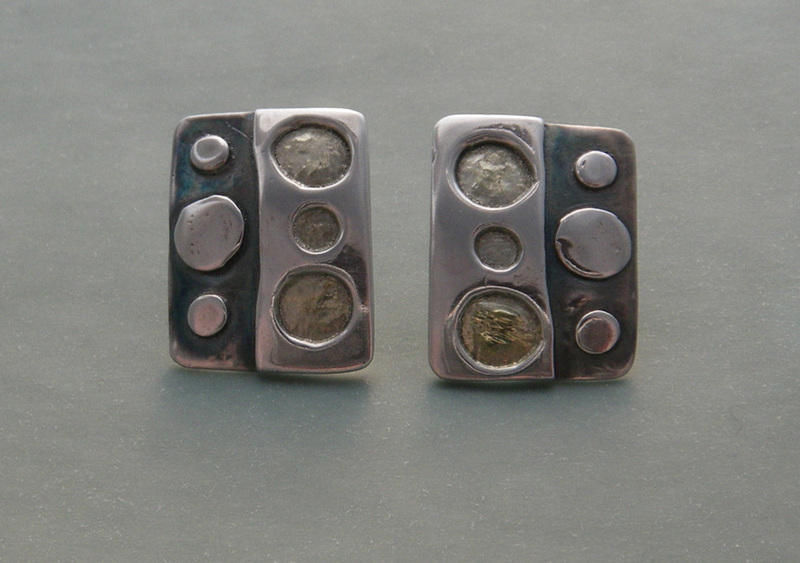 The edges were smoothed and the corners were rounded with a file after the earrings were fired. The hint of gold in the recessed circles was my first attempt at using Aura 22 before I learned how to keum-boo. I’ve learned a few new techniques since I made these earrings, but the design still pleases me. When my new batch of PMC arrives tomorrow, I might just have to try a “remix” of this pair. but, hey! how did you attach the gold posts?! i know nothing about gold…can you use silver solder with gold? Here’s what I know about gold. It does not conduct heat as well as silver, so reaches a melting point much more quickly than silver. The heat is more apt to stay in one place. If I haven’t soldered gold in a while, I usually end up using 3 posts for a two post job. The first one balls up unintentionally! Hey, did you get your canon copier? i did! been makin’ tearaways like crazy! some real, actual jewelry is bound to come of it eventually, right?! how the inventory for the trunk show coming along? Cool Holly! I have some sheets that jackie printed out for me. None of them original artwork, but fooling around with some fonts. Haven’t tried any tear-aways yet. Inventory in progress. Panic in progress!